The Museum and Library of The Hispanic Society of America is perhaps the least known of New York City museums, yet it has an extraordinary collection. I recently spent a delightful afternoon at the museum, which reflects the vision of Archer Milton Huntington to establish an institution dedicated to the celebration of Hispanic culture. Beginning in 1904, Huntington began to construct a series of buildings on Audubon Terrace and to assemble a collection of books and works of art which are today unparalleled in scope and quality outside the Iberian Peninsula. The collection includes more than 800 paintings and 6,000 works on paper, offering a comprehensive survey of Spanish art through masterpieces by El Greco, Goya, Murillo, Ribera, Velázquez, Zurbarán, Fortuny and Sorolla. The Museum's 1,000 works of sculpture contain significant examples from the first millennium B.C. to the 20th century. There are also magnificent examples of ceramic, glass, furniture, textiles, ironwork, jewelry and photographs. The Library offers resources to scholars interested in the culture of the Iberian Peninsula and Latin America through its collection of more than 250,000 books and periodicals, which include more than 15,000 volumes printed before 1701 and approximately 200,000 manuscripts from the 12th century to the present. When the MET sought to display the very best artifacts in its new Islamic galleries, it went to the Hispanic Society to arrange loans for 27 of its works. The collection is well known to me from my art history studies at William College and Harvard. 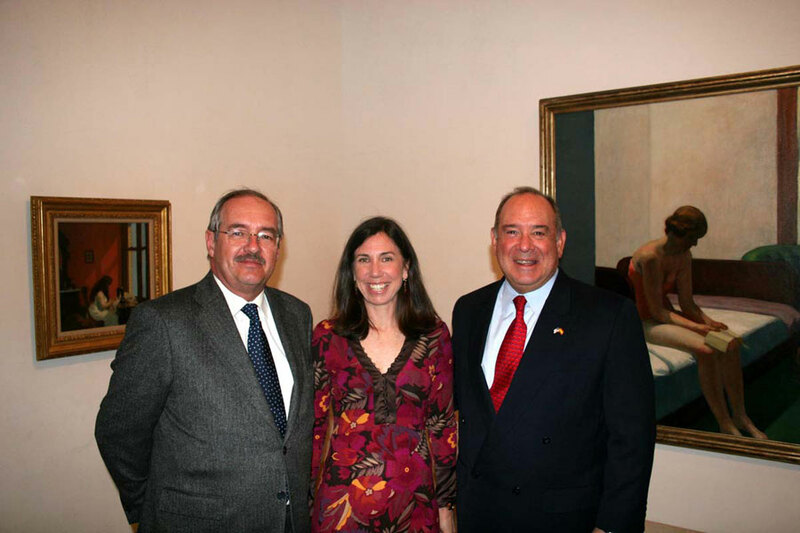 In fact, I hadn't seen some of the artists since my visit to Madrid where my paintings were on exhibit at the U.S. Embassy Residence and I was asked to give a lecture for the Ambassador. When I arrived I discovered the Ambassador had a list of events planned for my stay, including a trip to the Thyssen-Bornemisza Museum where I was to speak about American Art with the Director, the Chief Curator of the Collection and to a select group including the Ambassador. Thankfully my art history studies came through and the impromptu talk (on my part...) was well received and a previous visit to the collection when it was in their home and privately held on Lake Lugano also proved helpful. There were a few people at the The Hispanic Society when I was there, although for the most part, the museum was relatively empty. It offers a mini encyclopedic overview of Roman, Medieval, and Renaissance sculpture and paintings as well as decorative works of art without having to travel outside of NYC. Among the museum's highlights are El Greco's St. Jerome and Goya's Duchess of Alba - a large portrait with Goya's signature placed in a very large arc on the ground on which she stands (and a familiar face from my Art 102 exam). Upstairs along the balcony are paintings by Velázquez, El Greco and Sargent. The mosaics on the stairs particularly the Roman Head of Medusa are worth a look. The sculpture, particularly the sarcophagi from the tombs of the monastery of San Francisco de Cuellar exemplify the skill of the 1500s. There is a large room dedicated to the nine panels of Joaquín Sorolla y Bastida, a beloved Spanish artist who painted local scenes in color and light. The Academy of Arts and Letters, next to the Hispanic Museum's Beaux Arts building on East 155th Street, also occasionally has exhibits. The campus was designated a National Historic Landmark in 2012. I look forward to going back as I just touched the surface of a very deep collection.